Note: A couple of years ago I did a series of reviews for Halo-17, an Australian music and arts website which from what I can tell is no longer out there in cyber space. In the past I have occasionally linked to some of these reviews here at Twenty Four Frames. Recently, it seems all the links lead to an internet void; subsequently I have been occasionally posting these reviews here in updated versions. The original postings with broken links have or will be deleted. 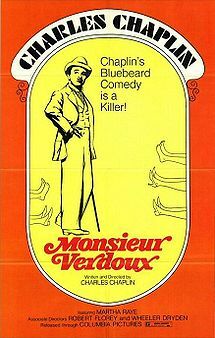 Dare I say that “Monsieur Verdoux: A Comedy of Murders” is Charlie Chaplin’s best film? If not, his best certainly one of the best, a brilliant black comedy unlike anything else in his portfolio. It was not his first feature film without The Little Tramp character, that would be “The Great Dictator,” though the Jewish barber may be a close relative. Verdoux is a completely different characterization with little trace of sentimentality., In its place, he had a mass murderer. Henri Verdoux is a banker with an invalid wife and a young son when the depression of 1929 arrived. Like millions of others, Verdoux lost all his money. In order to keep his wife and child living comfortably, Verdoux faked having a job where he had to travel. In various towns, he would court and marry wealthy women, only to poison them, keeping their fortune in the process. With his real family, Verdoux is a gentle, elegant and loving man. The family is vegetarian. When his son plays too rough with their cat, he scolds him gently. One of his rich “wives” is loud mouth, brash, uncouth Annabella (Martha Raye). She trust no one, refusing to tell Verdoux where she keeps her money. At the same time, Verdoux is also pursuing Marie Grosnay (Isobel Elsom) a financially well off single woman. After weeks of sending flowers, she finally succumbs; they go out and eventually plan to marry. But first, Verdoux needs to get rid of Annabella. After failed attempts to poison her, he takes her on a fishing trip in a small boat where he attempts to strangler her, and toss her overboard. However, he is once again stymied by the loud mouth nagging wife. Those familiar with Theodore Dreiser’s novel “An American Tragedy” will recognize Chaplin’s parody. The only touch of sentimentality in the film happens when Verdoux meets a young woman, just out of jail, only known as The Girl (Marilyn Nash). At first, he plans to murder her as part of an experiment with a new poison he developed. However, despite her recent problems The Girl is so full of life, Verdoux, in a moment of compassion, sends her on her way after feeding her. Some years later they will meet again. Verdoux is down and out, but The Girl is now a mistress to a munitions manufacturer and is doing well. Verdoux is eventually caught, put on trial and sentenced to hang. At the end of the trial, the judge asked him if he has anything to say. He is unrepentant. Chaplin, defending his character’s behavior says, “As for being a mass killer, doesn’t the world encourage it? Is it not building weapons of destruction for the sole purpose of mass killing? Has it not blown up unsuspecting women and little children……..As a mass killer, I am an amateur by comparison.” Later on, after being sentenced, waiting in his cell he continues his philosophy, “One murder makes a villain, millions a hero, numbers sanctify.” The film ends with Verdoux being led to the guillotine. The film does have some distractions, Chaplin’s high pitched voice for one as well as an unadventurous camera style, even for 1947. His use of close ups of train wheels traveling the rails to illustrate Verdoux going from one city to another is a prime example. Additionally, his courtroom speech is self righteous, coming across as paternalistic, speaking with a sanctimonious superior tone, even if there is some truth to what he says. The storyline is of course familiar, based on the famous French bluebeard, Henri Landru, who killed eight wives. Chaplin’s involvement in the film began when Orson Welles wanted Chaplin to star in a film he was making about a Landru type character. When this did not pan out, Welles sold the idea to Chaplin for $5,000 dollars, and a screen credit. It would take Chaplin five more years to get the film completed. After its initial release and failure, Chaplin’s first, the film was withdrawn from circulation and not seen for seventeen years. 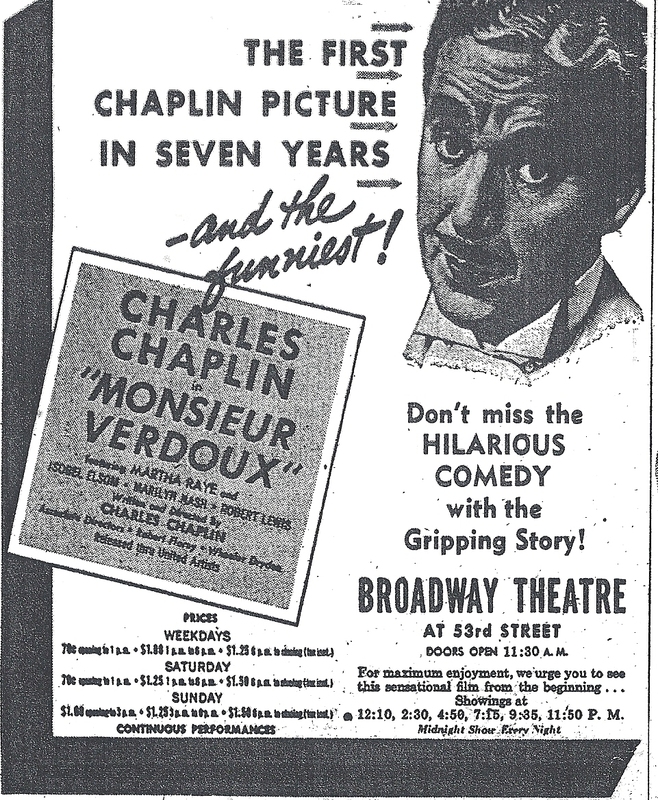 In 1964, The Plaza Theater in New York put together a Chaplin Film Festival and with that, “Monsieur Verdoux” was seen by the public for the first time since its initial release. The festival was a huge success with “Monsieur Verdoux” not only the highest grossing film of the festival, but breaking box-office records for the theater. By 1964, the public outcry over Chaplin’s politics died out. Though he did not come back to America until he received a lifetime achievement award from the Motion Picture Academy in 1977. Black comedies were more in vogue by then. In the 1950’s, there was Hitchcock’s “The Trouble with Harry,” The Bolting Brothers “I’m Alright Jack” and Ealing’s “The Ladykillers.” Hitchcock with his droll introductions to his classic TV show, “Alfred Hitchcock Presents” brought dark humor into our homes. The 1960’s saw Kubrick’s “Dr. Strangelove” and Tony Richardson’s “The Loved One.” The times had finally caught up with Chaplin and “Monsieur Verdoux.” Many critics today consider it one of Chaplin’s best and Jonathan Rosenbaum included it in his Alternative to the AFI Top 100 American Films list. Today black comedies are common from “The King of Comedy” to the Coen Brothers. This entry was posted in Charles Chaplin, Film Reviews and tagged Charles Chaplin, Martha Raye, Monsieur Verdoux. John,thanks very much for all the background on this film, an outrageous work that must surely have shocked postwar audiences. Isn’t it dreadful that critics, supposedly supporters of freedom in every way but most certainly of artistic expression, use the ad hominem attack in a major key when they dislike an artist for his or her private life or politics? Critical reactions really disturb me when it is evident they are not really reacting to the film. It’s their responsibility to see (to do this one must actually look! )all the elements in a movie. If Verdoux is unlike other Chaplin works, so what? 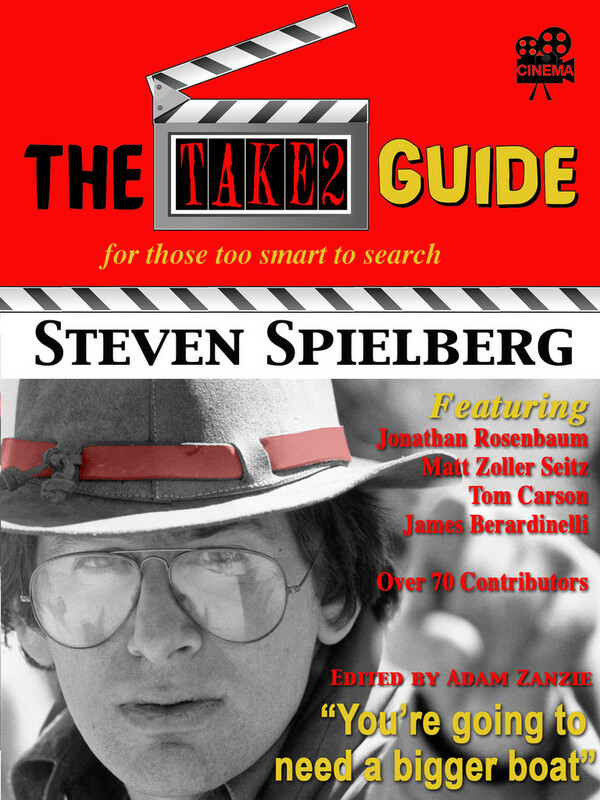 Analyze the film, not the creator’s politics. Thank heaven this film has been preserved so that it can be critically examined afresh in an unbiased fashion. John I agree that this is unnecessarily overlooked by most folks and very good film. It’s definitely worth the watch and is a fascinating look at the development of a director’s craft and refinement of his sensibilities. Nice take on Chaplin. Makes me want to watch it again. I have watched the film a few times now and really like it more with each viewing. A few minor things that I pointed out but this remains an unsung classic. John: I admire your candor. I saw MONSIEUR VERDOUX at the Film Forum’s Chaplin Festival last summer, and my opinion of the film actually got even better. Perhaps I can’t quite go as far as you did here, but heck it’s a masterpiece a nd as such, it’s all semantics when it comes to this staggering genius. A small minority have taken issue with the moralizing, but it’s what allows this film to trascend it’s genre trappings. Chaplin’s performance is extraordinary, and I’d say it’s my second favorite “black comedy” after Robert hamer’s 1949 KIND HEARTS AND CORONETS. I still need to see KIND HEARTS AND CORONETS which I always hear good things about. Verdoux is just a lot of deadly fun even with the moralizing. John, a lovely review of one of my favorite Chaplin movies. If it’s not his absolute best (I’d give that distinction to “The Gold Rush” or “City Lights”), it’s certainly among the best and for me definitely his best sound film. The barber in “The Great Dictator” was so close to The Little Tramp as to be indistinguishable. (I’ve always wondered what the first part of that film would be like if Chaplin had shot it silent with intertitles in the style of its time–1918. His character would BE The Little Tramp.) Verdoux was his first real departure from his familiar screen persona. 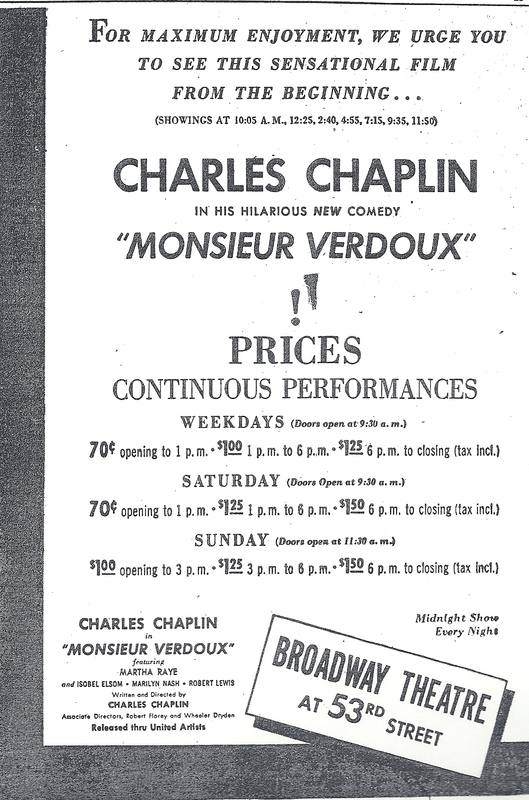 I’ve seen a poster for “Monsieur Verdoux” that reads “Chaplin Changes. Can You?” so the promoters must have realized, as you say, that the film and the character he played were likely to be a real shock to audiences of 1947. R.D. – The two you mention, and I will throw in MODERN TIMES, are among my favorites switching order of preference I think upon which one I watched last. I agree with you on the barber in THE GREAT DICTATOR being extremely close to his TRAMP character. I have not seen that poster you refer too but that was pretty progressive of them. Sooner or later, every good piece of art gets to have its time in the sun, and Chaplin’s Monsieur Verdoux hasn’t been an exception. This brilliant black comedy was certainly way removed from Chaplin’s oeuvre, and with his Leftist leanings, the film was destined for commercial disaster. But, fortunately for us cinephiles, the film has rightfully found its place among the pantheon of great cinema. I agree with you that the film wasn’t without its flaws, but Chaplin’s presence, his wit, the political incorrectness, the irreverent farce, they all added to make this film one of his most astounding works. Shubhajit – I agree 100 percent! In recent years this film has been duely recognized for its brilliance. Like many great artists he was ahead of his time here and the times eventually caught up with him. Thanks! 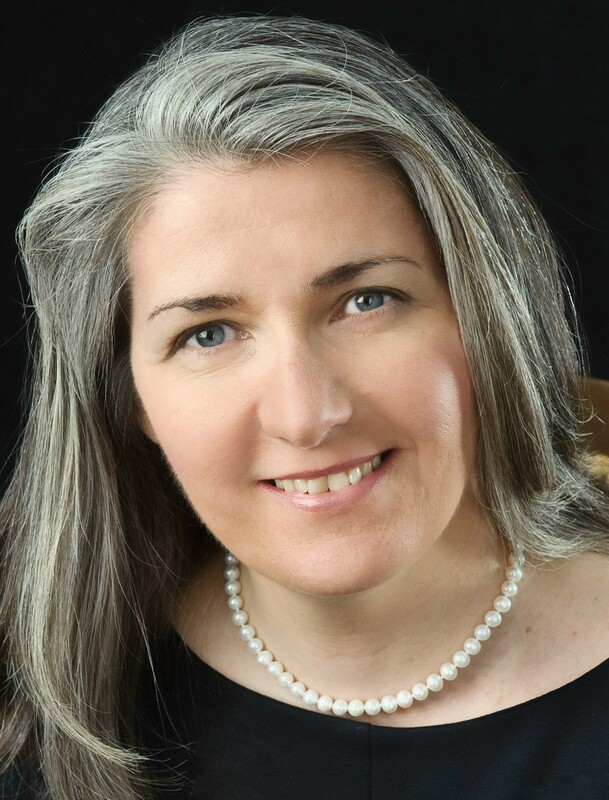 Eve – you and Sam both recommend KIND HEARTS AND CORONETS and as I mentioned to him that is still one I need to catch up on. The Brits do have a keen sense of black humor and like you I am a fan. Thanks again, very much! I enjoyed your comprehensive discussion of this film, where the story surrounding the film is as interesting as the film itself. This one is a sentimental favorite of mine — this despite the film’s dark and comedic nature. As you seem to suggest, it’s a bit uneven in tone, but I still love its many aspects, not the least of which is the comedic bits with Martha Raye. Great piece on a master’s controversial film that’s always divided critics. I like it, with some reservations, but the one feature that’s non-controversial is Martha Raye’s hilarious supporting turn, one of the greatest. John, if black comedy is your cup of arsenic you really need to treat yourself to “Kind Hearts and Coronets”. I’ve seen it more than once and still laugh out loud. Mark – You are the third person in this thread to recommend KIND HEARTS AND CORONETS! I am definitely going to have to hunt down a copy at one of the local libraries. I am glad this film has such support.